Thanksgiving has come and gone (this month flew by am I right?!) and now it’s time to really get into Christmas mode. Have you started shopping yet? Have you finished shopping yet? I’m somewhere in the middle! When I asked what kind of gift guides you would like to see, I got an overwhelming response for a gift guide for men. I rounded up RJ’s favorite gifts over the years + added a few things he’s getting this year. 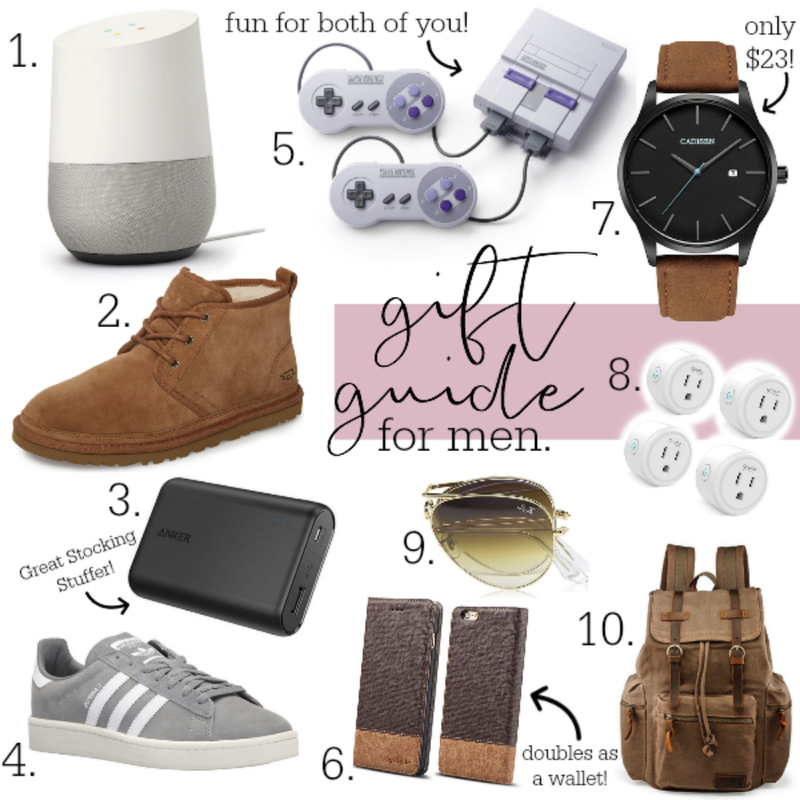 In my gift guide for men, I love to include a items that are affordable, functional, fun experience for you both or just something they’ll love. You’ll have to let me know if you have any major gift wins I should add, I’m still looking for a few stocking stuffers for hubs. Google Home Speaker ($79) *35% off : Google Home or Alexa (on major sale today!) make a great gift for anyone. I know RJ loves using ours for the weather, playing games and getting updated on the news. It also allows us to turn our home into a ‘smart home’. We have our TVs connected to it, outlets and more so that we can control multiple aspects of our home from both Alexa/Google (we have one in the kitchen and one in the bedroom) but also from his phone. Ugg Chukka Boots ($139. 7 Colors): RJ loves wearing his UGG house shoes and I thought these would be a little more appropriate for wearing in public. I love the look of these and they are lined with the classic UGG fur lining so I know RJ will love them. He doesn’t have these but I think I’m going to get them for him for Christmas. Portable Charger ($31) *On Sale: This was something I owned and RJ always stole. I finally decided to get RJ his own and ended up giving it to him early so he could have it on our trip. He loves it and uses it all the time. I’ve had mine since May, used it multiple times and it’s still working great! Adidas Sneakers ($65, 12 Colors) *On Sale: I gave RJ these for his birthday and he insisted I include them on your list. He wears them non stop and I don’t mind because I think they’re really cute! Nintendo Classic ($80): This was one of RJ’s Christmas gifts for this year and he already opened it. I gave him this a new TV but then I realized I couldn’t get the TV without his help so I had to give it to hi early. Then when we went to pick up the TV, RJ tried to buy this console and I had to tell him I already bought it for him. So his whole Christmas is ruined hah! This system is SO fun though. It’s preloaded with 21 popular games from the 90’s (Super Mario, Mario Kart, Donkey Kong) and two controllers. We stayed up until 4 am Saturday night playing with some friends RJ had in town and the next day his friend went and bought one. This is such a fun gift because you can enjoy it too! iPhone Wallet Case ($12): I gave RJ this last year and he loved it. It’s a nice iPhone case that also doubles as a wallet, so all their important things are in one spot. Isn’t it crazy this is all guys need, yet I lug around a 50 lb purse every day, ha! Leather and Black Watch ($23): I never told RJ how much I paid for this watch and he seriously thinks it’s a designer watch haha! I think it is so cute and he really enjoys it too. It’s the perfect gift that is so affordable, yet they’ll never know. Smart Outlets (4 for $35): This would be the perfect stocking stuffer if you gift him something big like Google Home or a new appliance. We have a bunch of these outlets and you can use them for lamps, turning on your coffee maker from bed, TVs and more. Folding RayBan Aviators ($150): RJ has the folding wayfarers and he loves them! They are great because they can fold up and go in his pockets. It’s literally his only pair of sunglasses, so I decided to get him another pair this year. Vintage Military Backpack ($30, 5 Colors): I got RJ this backpack for our trip to Europe this year and he surprisingly is OBSESSED with it. I swear some days he carries it without even putting things in it haha! It’s great quality and you cannot beat the price. So, what do you think!? All the pieces on my Gift Guide for Men are something RJ has loved for a while or I know he will be happy to get this year. If you get any of these for your BF/Hubby/Dad/Brother, man in your life, you must let me know what they think! Happy Shopping XO. Want to treat yourself after all this shopping? Check out my Amazon Faves for something you’ll love. Next Post New York City at Christmas – What to See, Do & Skip!